There’s a moment in Valeria Luiselli’s new novel, Lost Children Archive, that many readers can probably relate to: the unnamed narrator, while watching young unaccompanied migrant children board a deportation plane, falls into a fit of rage and begins screaming and kicking a fence. It’s not necessarily the screaming and kicking—or even the particular issue, however horrible, of government officers frog-marching young children onto a plane—but the helplessness one feels while witnessing such an injustice. There are plenty of injustices to have a fit about these days, though screaming and kicking may seem less like a cathartic act of individual protest and more like another slip into the backslide of political contention and deadlock. In short, screaming doesn’t actually help any of those kids—which is the central conundrum of Luiselli’s novel. What is one to do? As she road-trips with her young family from New York City to the Southwest, what the narrator of Lost Children Archive does—or tries to do—is set out on a documentary project to record the sounds of the “lost children,” the unaccompanied minors crossing into the United States who are jailed, abused, and lost or deported by the immigration system. Her husband, meanwhile, in a productive counterplot, is conducting a documentary project of his own: attempting to record the echoes of the slaughtered Apaches by, for example, capturing the ambient noise at Geronimo’s gravesite. Also interwoven is an imagined work of literature by the fictional author Ella Camposanto that follows a group of migrant children who are exiled not only from place, as are all refugees, but also from time (Luiselli mentions neither nation nor period) as they escape toward the “big city.” Throughout, the narrator artfully muses on the nature of documentation, of bearing witness, and of family-making. What Luiselli herself has done—seemingly in response to that same horrific knowledge of mistreated children—is another form of documentation: She has written a timely, probing, and beautiful novel. The content of Lost Children Archive spills over from her previous, nonfiction book, Tell Me How It Ends, about Luiselli’s work as a court interpreter for migrant children and what would later be paralleled but reimagined in the novel, a road trip to the Southwest that she takes with her family. The first book is explicitly political—an “X-ray” of one aspect of the US immigration system, as Luiselli calls it—effectively redirecting immigration-screening questions onto the reader. Even the titular imperative seems to be provoking us to do something to right this national wrong; it is up to us, all of us, to decide how to treat these migrant children. The novel, meanwhile, has its own essayistic edge, and probes even deeper into the crisis of children denied safety and sanctuary. That is, Luiselli seems to have taken her own prescription for how a nation should react to a refugee crisis: by taking a “look at itself in the mirror,” as she told me in a previous interview. There’s no evidence that the nation as a whole has done much productive introspection. After dealing with one crisis of unaccompanied minor children, the government responded by tearing even more kids away from their parents—as we saw with last year’s spike in family separation. Below is my interview with Luiselli, edited for clarity. John Washington: The main character worries so much in this novel about recording, documenting, archiving. I wonder, from both a journalistic and novelistic perspective, how you think we can best document this moment of history. And what about the crises of today—like those of immigration, but also the climate—that demand new methods of documentation? 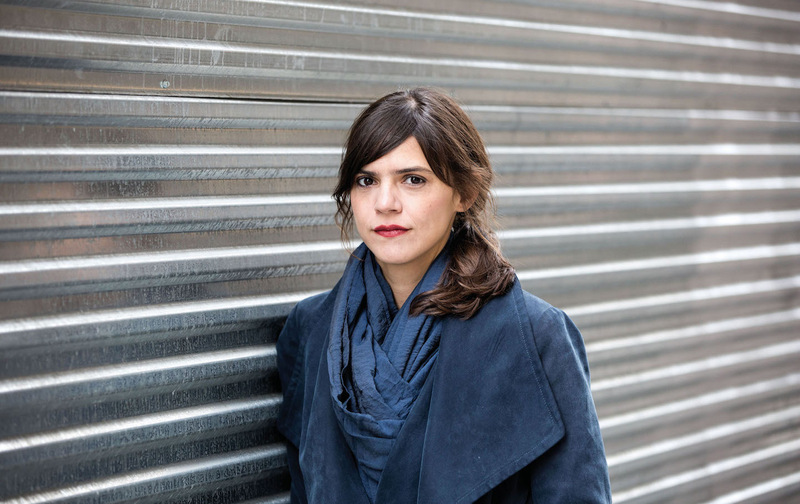 Valeria Luiselli: First, just in terms of a chronology between Tell Me How It Ends and Lost Children Archive: I started writing the novel, Lost Children Archive, in the summer of 2014, as I was driving with my family from New York to Arizona. I started making notes about situations that were unfolding on the border while traveling through what seemed to me a very abandoned America. An America of closed-down motels, towns taken over by the highways, chain restaurants, empty diners. An America with military planes flying above you all the time. An America of industrial farming. When I returned to New York from that trip, I had a bunch of notes, and about a hundred Polaroids, and I started working in court as a volunteer translator and screener. I continued writing the novel as I was doing that work in court, and I was using it as a sort of depository or vessel for all the things I was witnessing in court, as well as the general political confusion and sadness. And also as a place to explain this diaspora in its historical roots, about American interventionism in Central America in the ’70s. The novel was getting kind of stuffy and illegible, and I was not doing justice to the subject matter. I tried to, as you say it in Spanish, meterla con calzador (“jam it in,” literally, “use a shoehorn”) in a fictional narrative. So I stopped writing it, and at the end of 2015 I wrote Tell Me How It Ends, a more straightforward, simple X-ray of the American immigration system as it relates to these kids’ particular struggles to receive asylum in the US. Once I did that, I was able to go back to Lost Children Archive and think about it not as a political hammer, but as a space that was more multilayered, ambivalent, more like life—in the sense that it was not about any one thing, but about many things. That’s the kind of chronology, relationship, and tension between the two books. They overlap in places, but they serve different purposes. During that time, I was documenting and collecting archives of things related either very directly or tangentially to the subject matter. Directly, such as the mortality maps that the Humane Borders group has made over the years. They’re one of the few organizations here that contend with the disappeared, which is one of the most difficult subjects to talk about. JW: The term “disappeared” has a different resonance in Latin America, among other places in the world, than it has in the US. And there are echoes of “the disappeared” in your work, most obviously in the title itself. Do you feel you’re bringing a unique perspective to that issue and making us confront it in the US? VL: As you point out, it’s a conversation we’ve been having in Latin America for a long time because of the various disappeared. From the dictatorships in the Southern Cone, to now in Mexico, where at least 150,000 Central Americans have disappeared, and that is only the number of disappearances that are counted as such. We don’t know how many more it could be. And then the horror of mass graves as a kind of reminder that this is continuing. So, of course, there are lost children in many senses in the novel. There are children who have lost their right to childhood, which is how the narrator begins thinking about the situation. But as she spirals down into this horror journey, she realizes that the kids are lost in many other ways. They are lost in the system, which is what happens to two girls who go unaccounted for as they’re transferred between shelters and ICE detention centers, which is what is happening now. And then, of course, the children who go missing along the way. You know, so many deaths in the desert are really disappearances. The bodies are not found. So, yes, I was in dialogue with disappearance. But the thing is, how do you address disappearance? Because you are documenting what is not there. The whole archive in the book is an archive that surrounds and meanders around an empty center. Something that won’t be there. Or we might not ever be seeing directly. JW: Which seems to approximate your approach to fiction. VL: Maybe here’s where I get a little more naive and romantic. But this is what I do; I write. What else do I do? I don’t even know how to cook properly. So if there’s any answer in the novel, though I don’t think there’s any answer in this novel, it is that the story of this diaspora is the story of so many diasporas across history. This story’s elegies are composed of other people’s great journeys that are going on throughout time. And that, in part, is a response to the limitations we have as nonfiction writers and the limitations that journalism has in documenting crises. You can only ever document immediate presence. It’s hard to go beyond the urgency of that immediate presence. And in that immediacy there has been a constant that people migrating here are portrayed either very schematically, in terms of figures and numbers and surges and thousands and caravans and abstractions, which is hard to connect to, or they are portrayed in a narrative that is very victimizing and strips people of all their agency, all their politics. I think that maybe the stakes that fiction can offer are not portraying a heroic picture of the great epic of migration, but in reminding us what we have seen in history over and over, and we will see again. JW: The main character references a New York Times article in which a reporter refers to the “mostly poor and violent towns” in El Salvador, Guatemala, and Honduras, where many of the unaccompanied children are from. You write, “These children are utterly foreign to us, [those words] seem to imply. They come from a barbaric reality.” How do you break through the violent othering you recognize, and yet not minimize hard truths? VL: In terms of nonfiction, it’s what makes a good journalist a good journalist. I think that anyone who has the capacity and wants to have the capacity to observe beyond their own preconceptions of the world and people, and anyone who actually listens to stories, can write good journalism. And that’s the difference between a meaningful observation and a line that sounds absolutely arrogant, violent, reductive, simplifying, or othering, like “the poor violent nations of the South.” A line like that further foreignizes what is already foreign. JW: You write in Tell Me How It Ends, “Few narratives have made the effort to turn things around and understand the crisis from the point of view of the children involved.” You did exactly that in Lost Children Archive, handing over the narrative to the children in the second half of the book. What did that shift in perspective open up for you when you were writing it? Did inhabiting that space as a fiction writer change the way you look at the issue of child migration and child refugees? VL: On a basic level, I had been hearing the stories of children for a long while, so I was necessarily thinking about the ways that they tell their stories as they prepare their testimony. And how that has an impact and modifies the narrative that all the institutions and people around them are telling. The way that older generations pass on a story to the younger ones, but then the younger ones give it back with their own way of putting it together. One of the major meditations in the novel itself is how that process takes place. How parents pass on a particular way of articulating the world to their children, how their children rethread it in a completely different way. The kids in this novel, hearing their parents talk in the front of the car about the refugee crisis, and then reenacting it. Maybe their confusion—they confuse stories of American soldiers in the Indian Wars with Border Patrol agents—is a fertile one, because it’s a way in which history can be understood as a larger, more multilayered, and complex arc, how the present can be understood not only in its exceptional urgency, but also through what came before it. Historical confusion as a point in hermeneutics. How do we bring it into closer view? Because of course, bringing it closer implies imposing upon it our own concerns that are particular to our time, and to our personal obsessions. But isn’t conversation always like that? Conversation is always a bit of a misunderstanding.